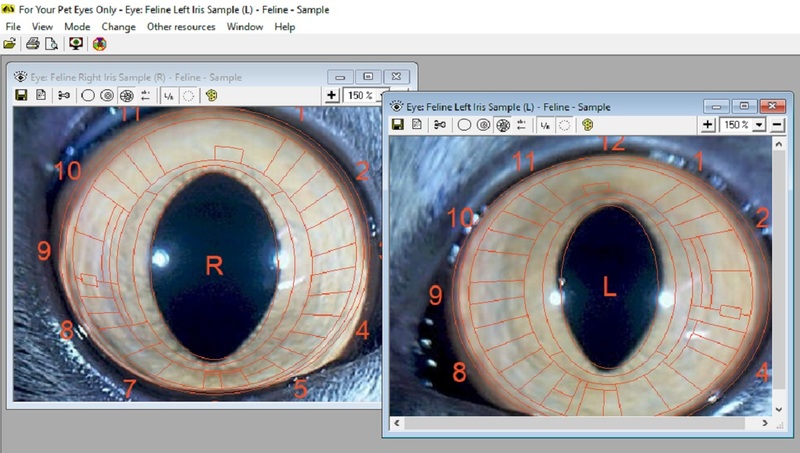 The FOR YOUR PET EYES ONLY (FYPEO) Canine/Feline Iridology analysis, scanning and reporting software program is designed for those who would like to be able to produce simple iridology reports and custom recommendations instantly based on the analysis of canine or feline irises. 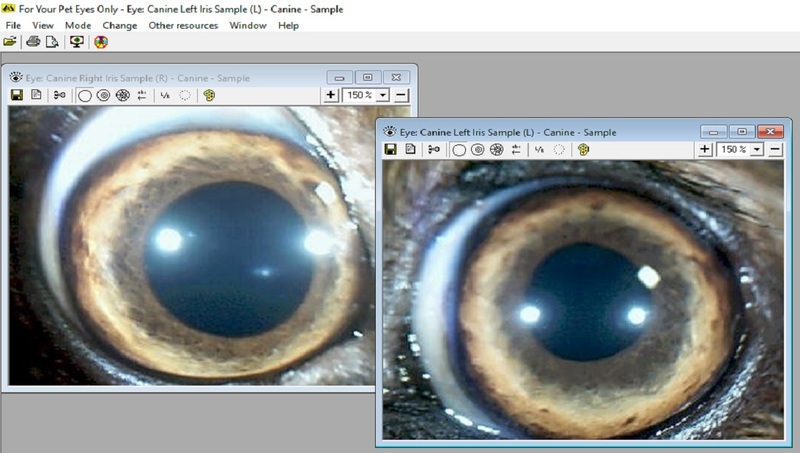 The FYPEO Canine/Feline software is a world first in the field of pet iridology. Ideal for pet owners, pet store owners, those working extensively with dogs and cats, veterinarians, or iridologists who want to extend their natural health service to include pets. The software requires you to already have a digital camera to capture the iris image. Once you have the iris images, they can be imported easily into the software for analysis, scanning and producing reports with recommendations. 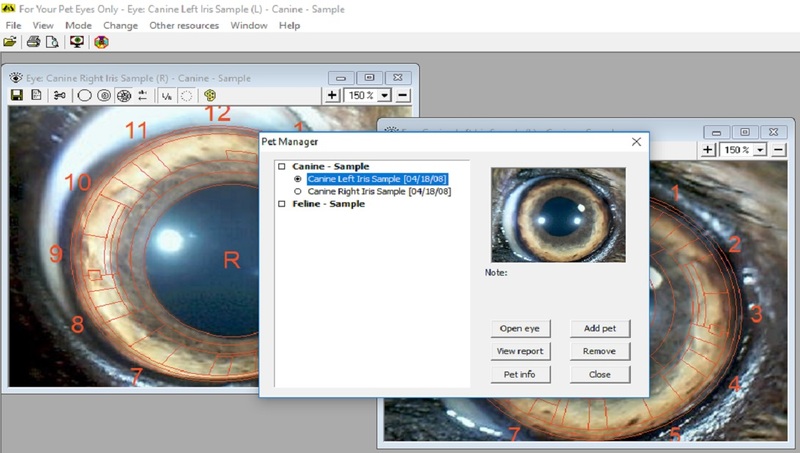 The For Your Pet Eyes Only (FYPEO) Canine/Feline Iridology software provides simple tools that allow for instant iridology analysis by scanning of the canine or feline iris image and producing iridology reports in seconds. 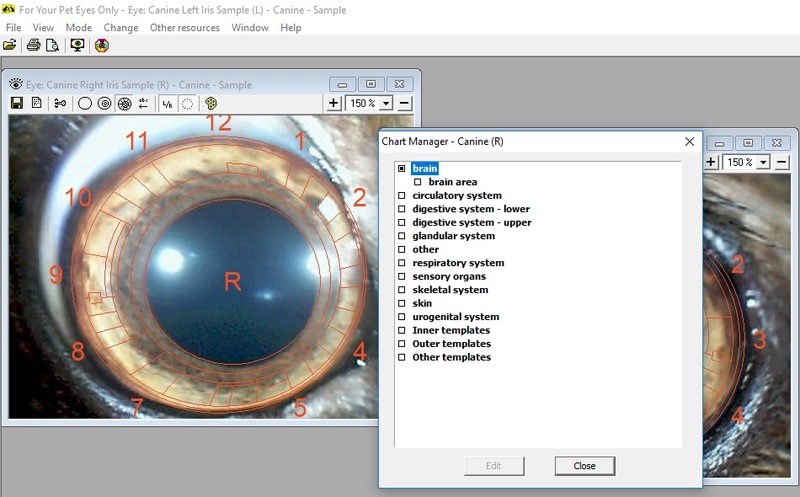 FYPEO Canine/Feline Computer Assisted Chart Overlay (CACO) – the software automatically recognizes the canine or feline iris and overlays a chart with only some manual adjustment. 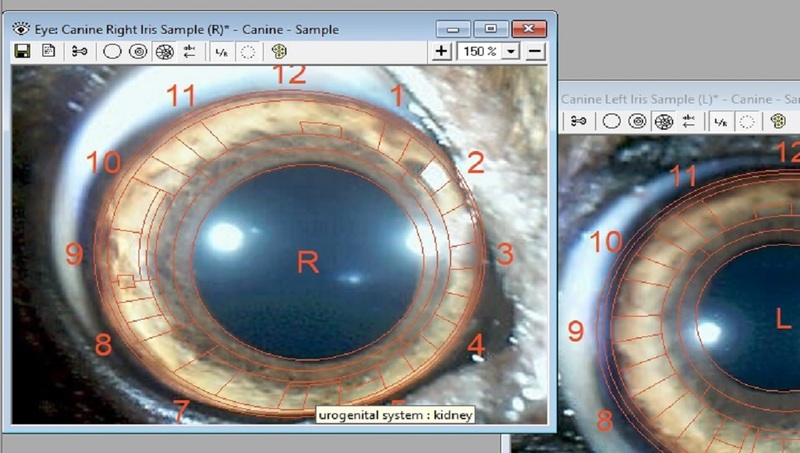 FYPEO Canine/Feline Scan function – within seconds the software scans the canine or feline iris, takes an average iris color intensity and then calculates a positive or negative value for each organ segment displaying graphically and numerically whether the organ state is acute, normal, pre-chronic, chronic or degenerative. Recommendations in your chart templates will be automatically added whenever the scan readings are below or above normal levels. (the software comes complete with pre-installed general recommendations but you can edit or custom insert your own) All this information is added to your iridology report with only a click of the mouse. 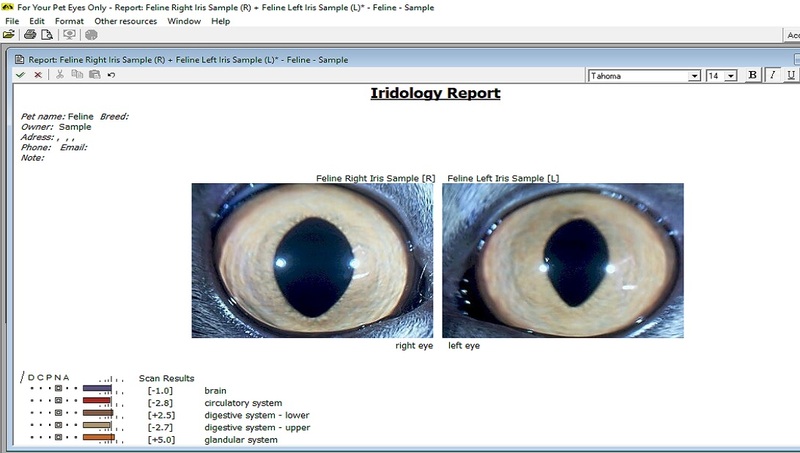 FYPEO Canine/Feline Chart Manager – a link between the iridology chart overlay and the report. This provides data templates for each organ area of the iridology chart. It allows you to use the pre-installed recommendations for each body organ or custom input your own treatments or recommendations, diets, herbs, vitamins etc. All this information shows up in your report instantly when you click on Instant Report. 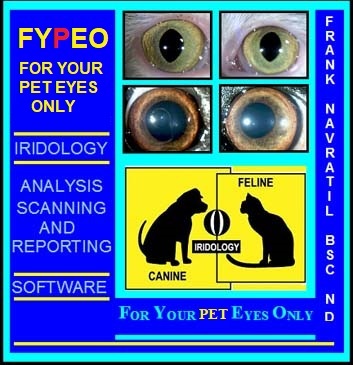 FYPEO Canine/Feline instant organ identification – never get lost when looking at the iris. At any time just click your mouse on any area of the iris and the body system and organ will be instantly identified or as you move your mouse around the iris you can see the body system and organ in the lower menu bar. 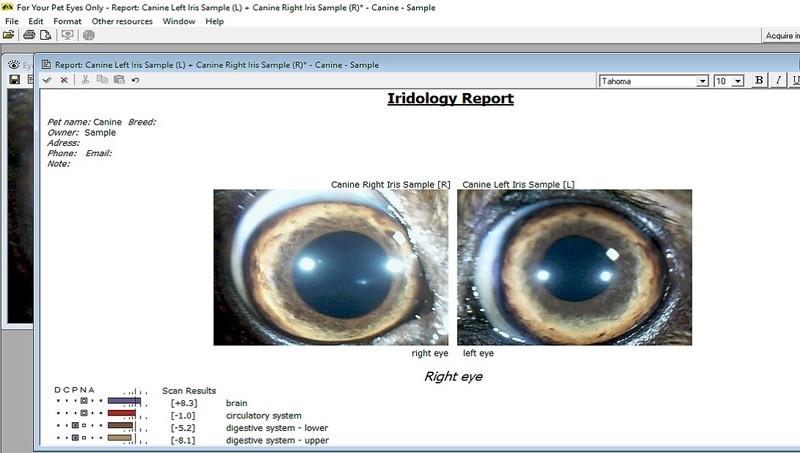 FYPEO Canine/Feline Instant Report – creating pet iridology reports has never been so easy even if you know nothing about iridology. The Instant Report function automatically produces a report in seconds. 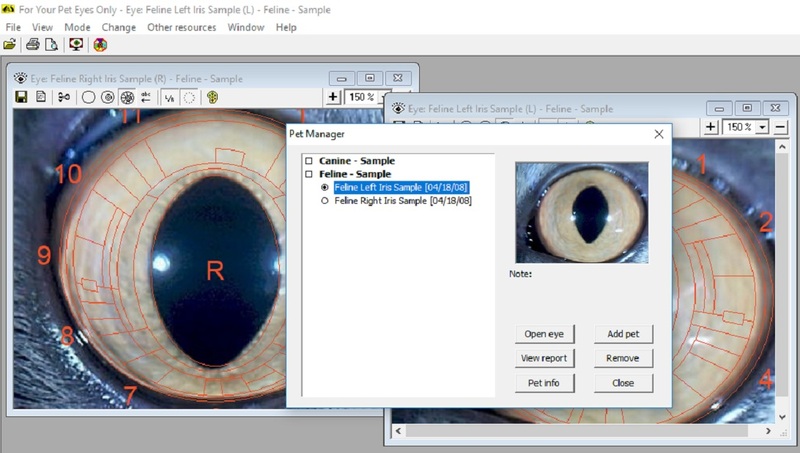 This report includes pet details, their right and left iris images, scan results and recommendations for both right and left irises. For the iridologist it also allows adding notes on colors and signs found which will be added to the report. Perfect for the pet owner, pet shop owner, veterinarian, or iridologist who can quickly produce a quality report for his or her client´s pets that will indicate weak organ areas, and provide recommendations. FYPEO Canine/Feline Pet Manager – manage your entire pet database with one easy software tool. The Pet manager function allows you to store unlimited data on each pet, including their scan results, reports, images, pet data, notes, treatments etc. You can at any time, quickly look up any past pet and view their irises, reports, scan results and other data. Managing your pet database has never been so easy. 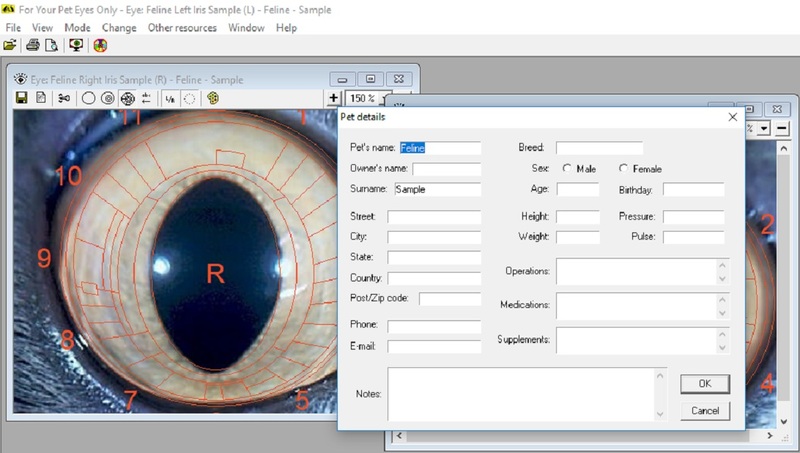 Email function – the software offers a quick method to email your Instant iridology report complete with iris images, scan results and recommendations to your clients if needed.